This rustic bear ceiling light adds an old world twist to rustic lighting. The graceful lines are accented with just a touch of nature by incorporating bear head silhouettes. Made in the USA. 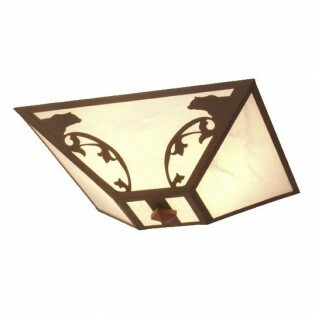 The Bavarian Bear Ceiling Light adds an old world twist to rustic lighting. The graceful lines are accented with just a touch of nature by incorporating bear head silhouettes. Crafted by hand this lodge style ceiling light uses two 60 watt bulbs and measures 17"W x 7.5"H.. Made in the USA.